Why the Olympics are bad for China. Gao Zhisheng isn't naive. For years, the veteran activist and self-taught lawyer, an earthy man from a poor background with a wide face, jug ears, and thick, clown-like lips, has battled the Chinese government. After founding a law office in Beijing, he gained notice over the past eight years as one of the most combative advocates for desperate people punished by the state: practitioners of Falun Gong, who've been detained by the thousands; poor peasants trying to halt the graft of local officials; persecuted Christians. The authorities noticed him, too: After death threats, alleged assassination attempts, and beatings by government thugs, he was arrested in 2006 for "subversion"--supposedly planning to overthrow the government--and sentenced to three years in jail, though the sentence was suspended. In the run-up to the 2008 Beijing Olympics, the Chinese government had promised to act differently. After losing the 2000 Games to Sydney, partly because of its human rights abuses, Beijing realized it had to emphasize that hosting the Olympics would be a catalyst for internal change. Bidding for the event in early 2001, Chinese officials assured the International Olympic Committee (IOC) that the Games would help open up China. As Liu Jingmin, vice president of the Organizing Committee for the Beijing Games, declared, "By allowing Beijing to host the Games, you will help the development of human rights." In an agreement inked in 2001, Chinese officials guaranteed that the tens of thousands of reporters covering the Olympics would enjoy press freedom. China then announced its "Beijing Olympic Action Plan," a comprehensive framework that promised more legal rights for its citizens, better environmental stewardship, and significant input from the Chinese public about how the Games would be conducted. Chinese officials have continued hitting these themes: In October, Liu told reporters that the Olympic preparations have promoted human rights causes in China. Given China's promises, over the past five years politicians, activists, and many reporters have created a meta-narrative for the Beijing Olympics: With prestige on the line, and the international press descending on Beijing, China simply would have to improve. The Olympics offers China "an enormous opportunity to change world perceptions and implement significant reforms," said Senator John Kerry after Beijing won the bid. "[T]he Olympic Games will have definitely a positive, lasting effect on the Chinese society," echoed IOC president Jacques Rogge. Environmentalists, too, took up this refrain, arguing that, because China did not want the world seeing Beijing's horrific pollution, it would embark on a rapid campaign to clean up the capital before the Olympics, a campaign that would spill over and spark environmental concerns across China. And, in the past year, as activists have realized that China is becoming a global power, campaigns for Darfur, Burma, Tibet, and other hotspots where Beijing has influence have jumped aboard the Olympic wagon. Through the "Genocide Olympics" campaign, Darfur activists abroad have drawn attention to China's relationship with the government of Sudan, where Beijing is the major investor and diplomatic protector. In the wake of the brutal crackdown in Burma, some campaigners have attempted to link that uprising to China's influence in the country, with The Washington Post titling the 2008 Games the "Saffron Olympics." Even anti-tobacco activists took hope: Beijing had promised a smoke- free Olympics, and smoking opponents believed the Games might boost the anti- tobacco movement in China, a country where over 35 percent of adults light up. All these activists saw the Olympics as much more than just two-and-a-half weeks of running, jumping, and throwing. Which is why Gao Zhisheng stepped forward again last fall. In an open letter published in September, he warned, "Today, as we approach the Beijing Olympic Games, I ask you to pay attention to the ongoing human rights disaster in China, and wish you to forward my appeal to the whole world." Gao didn't have to wait long for his answer from the government. On September 22, he was secretly rearrested. Apparently, the activists were right: The Olympics are indeed changing China--for the worse. THE OUTSIDE WORLD has been all too happy to oblige the theory that the Games would liberalize China. 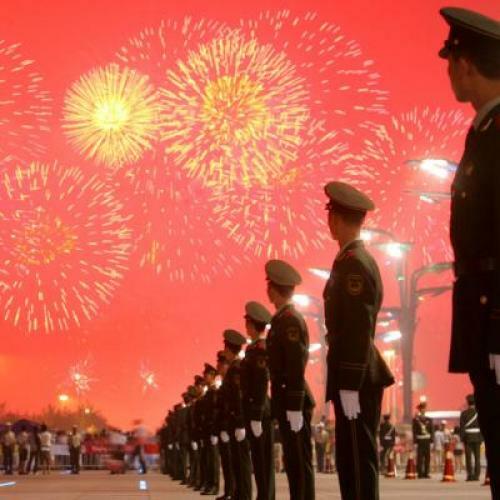 In six months, Beijing will host the biggest Olympics in history, an exquisitely stage-managed celebration of China's emergence as a world power that will cost, by some estimates, $40 billion--vastly more than has been spent on any previous Olympics. Beijing has built a gleaming new airport terminal and numerous iconic new buildings, like the towering China Central Television headquarters designed by Rem Koolhaas; across China, even in the smallest cities, clocks in public squares tick down the seconds to the Games. Corporate sponsors, like General Electric and McDonald's, which are the financial lifeblood of the modern Games, want to cultivate the world's biggest market. Beijing has already attracted 50 percent more sponsors than Athens did in 2004. One prominent human rights activist told me that her organization has failed to get any major company to reassess its support for the Beijing Olympics because of Chinese human rights abuses. The IOC, hardly a democracy itself--it has suffered massive bribery scandals and was run for years by Juan Antonio Samaranch, a former official in Spain's fascist Franco regime--has accepted China's promises of change. Yet, since obtaining the Games, China's human rights record has actually regressed. Human Rights Watch recently concluded that "legal reforms [have] stalled," Chinese officials have stepped up their censorship of online forums, and authorities have targeted the "network of lawyers, legal academics, rights activists, and journalists ... which aims to pursue social justice and constitutional rights." "Instead of a pre-Olympic 'Beijing spring' of greater freedom and tolerance of dissent, we are seeing the gagging of dissidents, a crackdown on activists, and attempts to block independent media coverage," announced Brad Adams, head of Human Rights Watch's Asia division, a conclusion echoed by a recent Amnesty International assessment of China. Meanwhile, as a Financial Times report revealed, the Communist Party has tightened its grip on Chinese politics by co-opting more entrepreneurs into the Party and taking over greater swathes of government bureaucracy. Even the Olympic pledge of press freedom has not been met. Beijing has imposed a law restricting foreign news agencies working in China and also tightened control of the domestic press by launching a crackdown on "false" news and shuttering some 18,000 blogs and websites since April. Local journos who don't get the message wind up in worse shape than Judith Miller: In August, Chinese reporters interviewing people in a province where a bridge collapsed were attacked by plainclothes thugs, who kicked and punched the journalists. Beijing actually seems to have taken a cue from past Olympics held in authoritarian states, like the 1968 Mexico City and 1988 Seoul Games, both of which prompted protests in the streets. The lesson, several Chinese activists told me, is that China must crack down before the world's media arrives. And it has. In the most severe crackdown in years, Chinese authorities have arrested, abducted, and simply beaten activists, writers, and lawyers. Like Gao Zhisheng, another prominent lawyer named Li Heping allegedly was abducted, stuffed into a basement, and beaten with an electric rod. Yang Chunlin, an activist who organized a petition opposing the Olympics, reportedly was arrested and then tortured in jail. In other Chinese hot spots of protest like Tibet, repression also has become more severe. In recent months, armed police have surrounded monasteries, detained young Tibetans, and forced nuns and monks to publicly criticize the Dalai Lama. When several Americans tried to protest China's proposals to carry the Olympic torch over Mount Everest, the Chinese government arrested and deported them. Rather than opening China, the Olympics have given Beijing more leverage to repress human rights, because the government has mobilized popular support by portraying the Games as a national honor. The Financial Times recently reported that Liu Qi, head of the organizing committee for the Beijing Games, prodded officials to explicitly use the Olympics to boost nationalism. "Particularly, we should propagate the achievements made in building socialism with Chinese characteristics ... and the patriotic spirit and the Olympic spirit," Liu said. This state-sponsored nationalism allows Beijing to tar activists protesting the Olympics as unpatriotic Chinese causing the nation to lose face. In a country dominated by rising nationalism, and where many average people do actually see the Games as a major honor, this is a powerful state weapon. In fact, Amnesty International reported that Chinese officials are using the pretext of the Olympics to increase detentions for people arrested. One Beijing resident, an elderly woman who had watched the local authorities crack down on dissent throughout her neighborhood, complained to me that local officials constantly wield this charge of being unpatriotic against her. "At the beginning, we are very happy about these Olympics, but we are just losing our rights," she told me. "It's too much sacrifice for this Olympics." Her complaints are not unique. In an open letter released in August, some of China's best-known intellectuals, including former senior Party official Bao Tong, warned about the "growing number of questions and criticisms in our own society and from around the world about the violations of the human rights of Chinese citizens in the name of the Beijing Olympics." By supporting the Games--President Bush already has promised to attend the Olympics--major powers are bolstering the Chinese government. As in 1936, when the Nazi regime pointed to countries' attendance at the Berlin Games as a sign that the world accepted its legitimacy, so, too, the Chinese leadership can use the Olympics to suggest its global popularity. Bush is providing "an enormous propaganda opportunity to an abusive government," Human Rights Watch's Asia advocacy director, Sophie Richardson, told The New York Times. The International Olympic Committee and the Olympic federations of other nations, meanwhile, have buried their heads in the sand. Asked in April about China living up to commitments on improving freedoms, Hein Verbruggen, a senior IOC official, responded, "We are not in a position that we can give instructions to governments as to how they ought to behave." (The IOC doesn't seem to have learned much, either: It recently awarded the 2014 Winter Olympics to Sochi, a town in authoritarian Russia.) The Olympic federations in nations like Australia already have warned their athletes not to speak out in Beijing about political issues. PERHAPS SOME OF China's failings will be exposed during the Games in August. Certainly, Beijing's intransigence will not stop all human rights activists. But China's security forces have developed some of the most extensive monitoring techniques on Earth, and the pre-Games crackdown likely will be successful, just as crackdowns before the recent Seventeenth Party Congress of the Communist Party prevented any major unrest during the crucial meeting. "All of these people will be watched, all the activists will be watched so they can't go out to the streets," Zhou Li, a prominent Beijing activist, told me, a claim supported by a recent Associated Press report that China's intelligence services are putting together a database of foreign journalists attending the Games. Nor have other campaigns pegged to the Olympics had much success. True, Darfur advocates have won meetings with senior Chinese diplomats, and, in recent months, China has appointed its own special envoy to Darfur and supported peace-keeping efforts in Sudan. But evidence suggests that this victory cannot be repeated. As unrest in Burma spiraled last fall, Chinese officials moved quickly to quash attempts to link Burma policy to the Games, and the Burma-Beijing Olympics movement has not gained much force. Efforts to improve China's environmental record have faltered as well. The government had vowed a "Green Olympics" and developed extensive plans to reduce Beijing's oppressive air pollution. But, in truth, it is taking only cosmetic steps--such as halting factory production near the capital before the Games and banning driving in the city. It has made no progress toward its promise of slashing emissions of polluting gases, and the U.S. Olympic Committee expects the air at the Games to be far worse than at any previous Olympics, including the 1984 Los Angeles Games. It already has advised American athletes to wear masks outdoors. Still, even if China's environmental policy hasn't improved, there's always hope the air will become cleaner. Maybe, after the Games, Chinese smokers really will give up their butts. This article originally ran in the February 27, 2008, issue of the magazine.